It’s kind of staggering how much Suits has evolved since its pilot. What started as the energetic but inconsequential story of a non-lawyer trying to bluff his way up the ranks of one of New York’s most prestigious law firms has now morphed into a show less about the people of that law firm than the firm as its own organism, feeding off the schemes of the lawyers in its scope. Pearson Hardman—now Pearson Darby, following the controversial merger at the end of season two—feels less like the cutthroat-yet-still-congenial law firm of early Suits and more like a cautionary tale of what can happen to people who get buried by their own hubris. This isn’t a story about lawyers; no, it’s a story about power, about perceived respect, and above all, about loyalty. 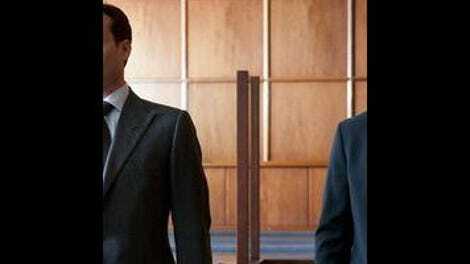 The problem is that on Suits, loyalty is relative, with Harvey Specter as its only arbiter. I’m not sure exactly when Harvey became an immovable object everyone must orbit (come to think of it, it might have been as early as his decision to hire Mike in the pilot, consequences be damned) but his increasingly rigid adherence to his own personal moral code is either going to take him down, or take the show down around him. 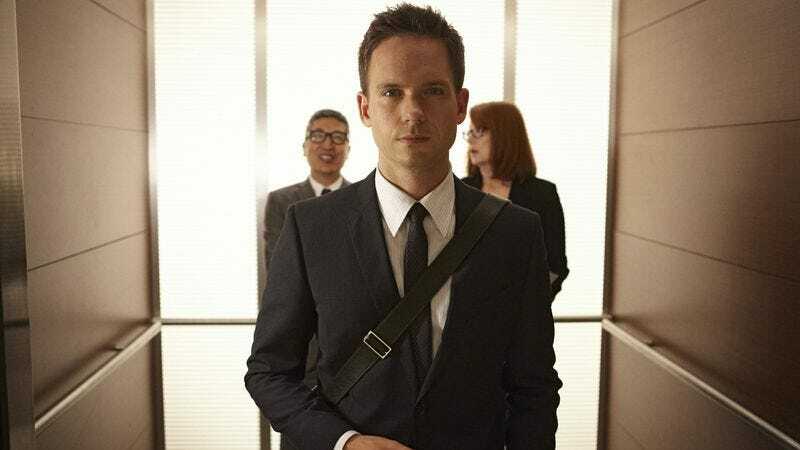 Suits became a great show when it took its characters’ rabid need to win and forced them to work together by giving them a common enemy to fight. The question is, can it remain a great show when these very same characters cannibalize themselves to fight each other in a quest for power? After the somewhat disastrous season two finale and this much improved—yet still concerning—season three première, the jury is still out on this. Don’t get me wrong: This is a slick, polished, entertaining-as-hell hour. Suits has more internal forward momentum than most anything else on television right now, and when it’s on, like it mostly is here, it just cooks. But by setting up this season’s big conflict as Harvey attempting to take down Jessica, the show feels precariously close to losing one of the best things it gained in season two: its soul. Basically, what Suits is doing right now is breaking down the very tenets of every dynamic it established last season and rebuilding them again, with Harvey as the central power figure. Season two was all about Jessica, Harvey, and Mike working together to take down Hardman, but season three has a much more sinister goal in mind: Harvey working alone to become more powerful than Jessica. The frustrating thing about this is that Harvey could have been Jessica’s equal ten times over, but every time it was offered to him he declined out of some sort of moral indignation that he didn’t “earn it” himself. Harvey is staunchly determined to create his own destiny and obsessed with loyalty—but only loyalty as filtered through his personal interpretation of it—and any perceived slight to that loyalty is an egregious error that results not just in shunning said person, but in vengeful punishment. When Jessica merged the firm with Edward Darby’s against Harvey’s wishes, it was as if Jessica personally insulted him. His solution to the problem is to use Darby’s affection for the client in the case he is working (an oil pipeline bribery case that looks to get juicy enough on its own) to broker a deal: If Harvey wins the case, Darby and his 51% of the company will back Harvey over Jessica for managing partner of the newly formed Pearson Darby. My hesitance as to what this means for the relationship dynamics on the show doesn’t mean it isn’t exciting. This is law show as chess match, with the cases as the pawns in the real game for power. It’s admirable of the show to never tell the audience who they should be rooting for, which gets especially admirable when you consider it hasn’t had a point-of-view character since season one. But it’s also suffocating. Power of this sort ultimately feels like an empty reward and the sacrifices that must be made along the way in the quest for it are often much greater than any satisfaction power can give, an issue well trod in the sister show of this season’s two big guest stars, Conleth Hill and Michelle Fairley. Poaching actors from Game Of Thrones to use as puzzle pieces in a power struggle is a cute little in joke, sure, but Harvey could stand to take some advice from that show’s far more deadly consequences. If he continues this way he might end up as the ultimate triumphant victor, asking for no help from those around him along the way, but then he’ll just be powerful and alone, surrounded by the wreckage he created scrambling to the top. Does Harvey want that to be his legacy? The hints we’ve gotten of his background only graze the surface of the betrayals that shaped Harvey’s worldview. But for someone who appears to be embracing his new lone wolf status, he sure spent a lot of time building his relationship with Mike. That’s the outlier here, the season’s big wild card: What will happen with Mike now that Rachel knows all of his secrets? Rachel—operating as some sort of audience stand-in—gives Mike the perfect out, telling him to simply quit and stop lying. It’s the only logical thing to do, which makes it doubly frustrating when Mike not only refuses to do it, but Rachel decides to continue a relationship with him after he refuses to do it. Mike was always a con man, but he started as the con man with the conscience, a conscience he slowly lost over season two. Now he’s nothing more than a mini-Harvey blackmailing IT guys and using any leverage he can to get what he wants. The trouble is, the man who shaped him now wants nothing to do with him. But hey, at least he got the girl! The issue between Mike and Harvey comes down to loyalty, which is obviously going to be the central theme of season three. But what does loyalty mean in a world where everyone is lying to each other in an attempt to come out on top? Suits asks a lot of questions but steadfastly refuses to give the answers, which is both heartening and maddening. As a rebound from the sagging end of season two, this première is a delight. As a signpost of what is to come in season three, well, let’s just say I’m reserving judgment. The opening dream sequence is a plot device that needs to be thrown out the window. And then buried in a safe. At the bottom of the ocean. Daniel Hardman telling Jessica one day Harvey would turn on her just like Jessica turned on him was a thoughtful long-term story beat that paid off handsomely here. I don’t know what to think about the Louis plot so far. Louis is so important to the show—his dynamic with both Donna and Mike is great here—but can’t the poor guy get a win? For some people, backstabbing is rewarded. For Louis, it’s always punished. He is the flipside to Harvey’s confident coin. Donna tricked Louis into doing a Hitler impersonation. I’m just going to leave that there.